A century has passed since the arks appeared out of the depths of space and into the blue sky of their humble planet. The alien animals on board have made this planet their new home. They live in their wilderness, they're sold in their markets, and their mysterious origins are even worshipped by some. Like floating shipwrecks, many of the old arks still orbit the planet, waiting to plummet to the ground below. Kairn is an Ark Land scavenger; someone that tracks ark debris impacts to salvage and later pawn. 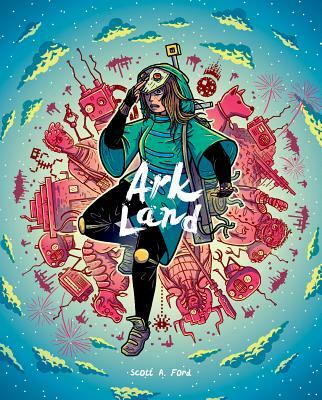 But when the local radio station announces a contest, offering a sizable reward for the latest ark debris, Kairn is unwittingly thrust into a quest full of colourful characters, strange places, and bizarre creatures. Scott A. Ford is an award winning comic creator, illustrator, and designer from Winnipeg, Canada. His work puts an emphasis on atmosphere and rich visuals, drawing inspiration from video games, graphic design, film, and animation. His comic projects include Romulus + Remus, Giants' Well, and Ark Land. Scott's experimental fantasy horror comic, Giants' Well, received a 2017 Manitoba Book Award, for book design and illustration. His work has been featured in galleries, publications, on beer cans, and book covers, and has spoken about his artistic practice at numerous public presentations about art and design.